Today we are ecstatic to host the Invincible Summer Blog Tour. Don't forget to enter our giveaway below. 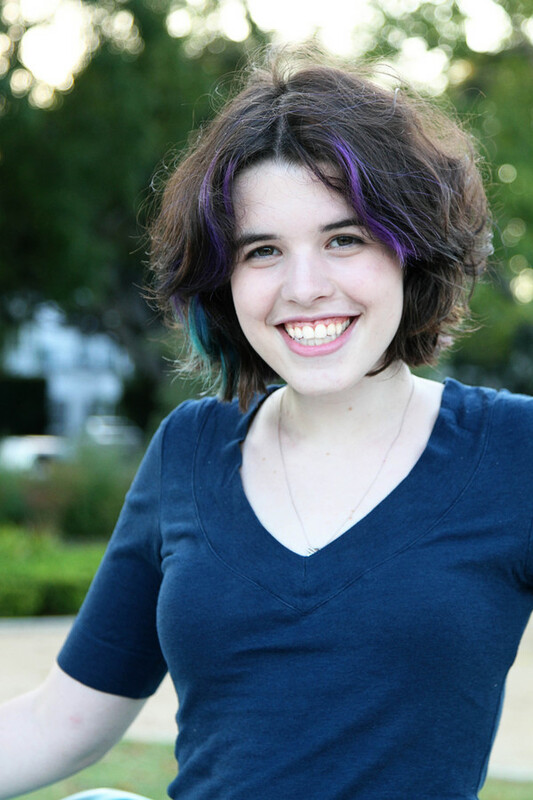 About the author: Hannah Moskowitz wrote her first story, about a kitten named Lilly on the run from cat hunters, for a contest when she was seven years old. She was disqualified, as her story was dubbed too violent. Her first book, BREAK, was on the ALA's 2010 list of Popular Paperbacks for Young Adults. She is a student at The University of Maryland (from Goodreads). Her website, blog and Goodreads page. Our review: There are books I begin reading that immediately make me sit up and take notice. There’s something about the character’s situation, ability or, more importantly, the voice that grabs me as being outstanding. While reading Invincible Summer by Hannah Moskowitz, I knew from the opening pages this story was different. And don't let the summary fool you, this book has so much more going for it than just a kiss and a summer fling. Much more. Told from the viewpoint of Chase McGill, a fifteen-year-old guy, he has the right amount of snark, emotions and unique ways of looking at things. We experience Chase’s life over the next four years each time his family visits their summer home. What a wild, crazy and emotional carousel ride this cast of characters take us on. From his hormonal rages with the older girl next door, Melinda, to the tumultuous then final falling apart of his parent’s relationship, to his dealings with his siblings--older brother, Noah, younger sister, Claudia, and baby Lucy--we know Chase has to deal with A LOT. But it is the relationship between Chase and his deaf younger brother, Gideon, that gives this book heart, soul and so much raw emotion I’m convinced they’re real. The scenes between brothers were so touching and realistic. Yes, there were times Chase was understandably frustrated when trying to communicate with Gideon, but he still seemed to understand the boy the best. Often defending him or translating his signing for others, Chase’s unselfish love for Gideon came across clearly and with a tremendous amount of power. During their summer vacations at their beach house, Chase's parents turned into “users”--always asking the other kids to "watch out" for the younger ones. What teen wants to spend their beach vacation babysitting siblings? Noah was unreliable, always disappearing when needed, and often times Claudia didn’t want to bother signing with Gideon. Chase’s strengths came across in the quiet moments with family members, Melinda, or when he was alone, playing guitar. Chase’s use of quoting philosopher, Camus, (a habit he picked up from Melinda) was interesting and quirky—there always seemed to be a great quote to symbolize the moment. As the years change, Chase sees his family changing too, and with his gritty and honest insight we understand what he is totally going through. The bottom line is our family is all we have and we have to learn to deal with them, no matter what they’re still blood. I thoroughly enjoyed Invincible Summer and felt for Chase, his family problems, with their tragedy later on, and with himself. It was refreshing to see a male teen unstereotypically portrayed as ‘touching’ and ‘overly affectionate.’ Chase mentions his being too affectionate at one point, about how Claudia is helping him get a handle on it, but it may not be working. Chase’s voice was the cement in this novel. The family dynamics, no matter how many times I wanted to scream at someone in the McGill family, were powerfully conveyed through so many scenes. The dialog was spot on and had me laughing or smirking at times and at others feeling sad or reaching for a tissue. It’s interesting how whenever I vacation at the beach I always wish I had a house overlooking the water. Here, Chase’s family had that gorgeous home, but even the lure and beauty of the ocean couldn’t help fix what was wrong with the members inside the house. If there’s one contemporary to read, make sure it’s Invincible Summer. Better yet when you're planning your vacation, make sure to pack this book or download it into your ereader. “In the booth next to us, someone’s laughing, and I’m suddenly aware that we’re surrounded by families. These families that are chatting and laughing, ha ha ha, the ones that looked at us and smiled and were jealous of our two birthdays. These families are all around us. They’re not a myth. Book cover: I know the bikini clad model goes perfectly with the book's summary, but after devouring this book I know the story is more than a summer crush. For me, it's OK. Thanks to Hannah Moskowitz and Ms. Dave at FinePrint Literary Management for including us on this tour. Don't forget to visit Just Your Typical Book Blog on Wednesday for the next blog stop. We are also happy to announce one reader will win one copy of Invincible Summer. All you have to do is enter here. The contest will end midnight on Saturday, April 30. Thanks everyone. Enjoy the book and the tour!